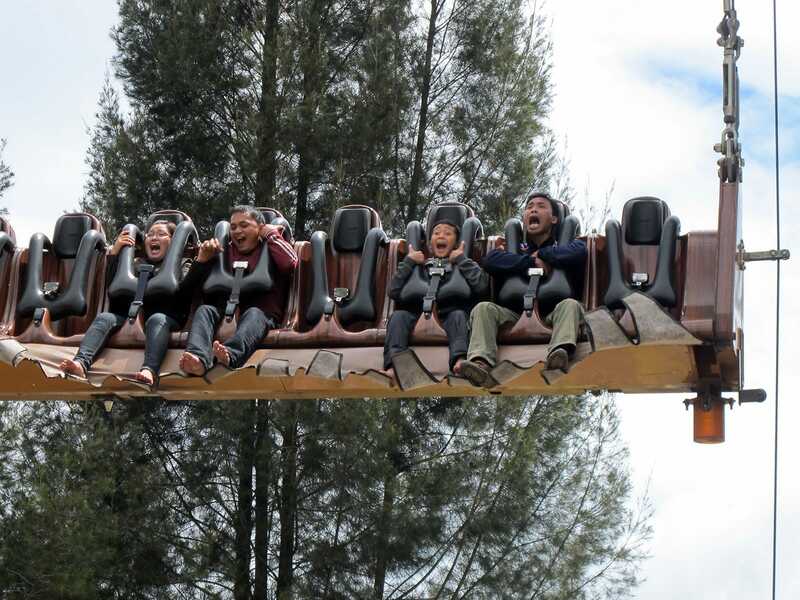 I felt like a minor celebrity walking into Funland, a medium sized park located in the mountains of North Sumatra. It was immediately obvious that the vast majority of patrons had never seen a westerner before, and huge numbers wanted their photos taken with me. It would have been churlish to refuse, especially since they seemed so excited by my presence. Despite my apparent novelty value, it's worth noting that the park is set up for tourists; the park map is available in English, and the staff I dealt with all had enough of the language for me to make myself understood. The admission fee for a day was INR 65000, roughly €5.50, making it excellent value for money. The owners have clearly invested heavily in making Funland what it is, and they're far from finished; there was a large building under construction in the middle of the park, and a number of other smaller building sites in other locations. The areas that were complete all had excellent theming, with some unique attractions that looked particularly neat, such as Koomba Dance, an adult-sized frog hopper equivalent with the ride vehicle hanging from cables rather than attached to a physical structure. The Sea Monster ride also looked seriously cool. The park has two coasters; a family ride named Buzz Coaster (#1759) and a large wild mouse style ride named Dino Tracker (#1760). The latter is pretty good, though enthusiasts should be aware that it does close in the event of high winds. During my visit it operated for just fifteen minutes in the early afternoon, during which I managed two laps; when I went back for a final ride just before leaving the park it had closed again. The ride isn't one that would in itself justify a trip to what is a pretty remote park, but instead I'd consider it to be the icing on a very worthwhile cake.